Independent Resellers and Restructuring a Business for the Digital World! 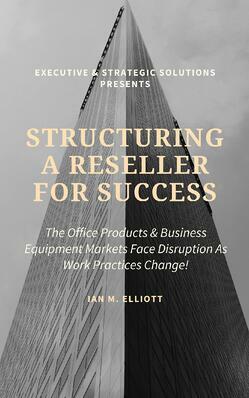 How must a reseller structure its business for success? The implementation of technology is changing legacy work practices and workflows which combine to reduce print requirements. Learn why certain building blocks must underpin the structure of a reseller before a transformation from analog to digital can take place! Today's workforce carry out the tasks necessary for fulfilling their responsibilities in different ways to those that used to be accepted as the norm. Consumers have embraced online purchasing and now have an expectation to be able to efficiently source their requirements from online portals. More than 70% of buyers independently carry out online research before they will consider talking directly to a salesperson! How must independent resellers structure themselves for a digital transformation? Absolutely. Just sharing some free knowledge that we hope you’ll find useful. In return, all we ask is that you please keep us in mind next time you have some questions about how to grow your office products, supplies, and equipment dealerships!